Being a designer trying to break into the field of professional design I found this article helpful and information. Good source of inspiration to try something new and push myself to become better. The shorts list below is some of the advice that stood out to me from Doug Bartow, principal of ID29 article. You are a professional communicator; act like one. Carefully edit everything you publish: résumés, social media, e-mail, blog posts, letters, text messages, everything. Often, being a good typographer means not making the simple mistakes. To accomplish this, you’ll need a working knowledge of classical typography. Go get one. “The Elements of Typographic Style” by Robert Bringhurst, “Thinking With Type” by Ellen Lupton and “Grid Systems in Graphic Design” by Josef Müller-Brockmann are cover-to-cover must-reads. Repeat after me: “Free fonts from the internet are crap, I will not use them.” Keep saying that. Be confident in yourself as an author, designer, photographer, creative. Don’t work in a particular personal style. Rather, develop a personal approach to your creative work. Your commissioned work should never be about you, but it can certainly reveal your hand as the designer. As your work becomes more well-known, you will get hired for exactly that. For your personal work, don’t be afraid to tell your story. No one else is going to do it for you. Find and save relevant and interesting things and pass them along to your friends, co-workers, followers and clients. Use the web and social media to share your own photos and work, as well as the work of others you find engaging. Be funny, serious, irreverent, businesslike, self-promotional, curatorial, whatever—just be yourself. For everyday inspiration, surround your workplace with the design ephemera you collect. Contrary to what you might read on the blogosphere, print is not dead. The beauty and tactility of a well-printed piece on quality paper cannot be appreciated or replicated on a screen, tablet or mobile device. Paper manufacturers, merchants and printers are doing a terrific job helping designers make sustainable paper choices to minimize the impact on our environment. Become well-versed with the Forest Stewardship Council certification program, and use this knowledge to choose your papers wisely. Clients are demanding it. Technically, Elvis is still the king, but for the sake of this argument, let’s put an emphasis on the message, and consider design as a plan for delivering it. The most effective and memorable visual communication almost always has the right mix of form and content, regardless of medium. Good design can engage a viewer, but interesting content will keep them reading, and thinking, past the headline. 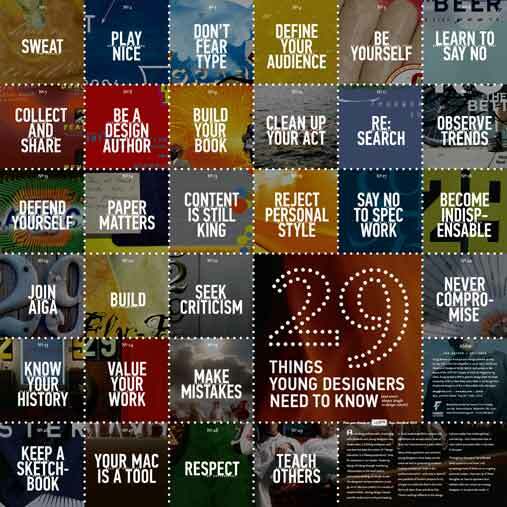 29 Things Designers Need to Know + 8 Ingredients for Success from HOW.